Illus. in full color. "Winter's story begins with a peg-leg sailor who aids slaves on their escape on the Underground Railroad. 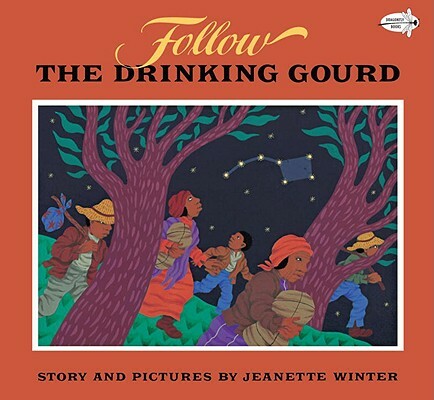 While working for plantation owners, Peg Leg Joe teaches the slaves a song about the drinking gourd (the Big Dipper). A couple, their son, and two others make their escape by following the song's directions. Rich paintings interpret the strong story in a clean, primitive style enhanced by bold colors. The rhythmic compositions have an energetic presence that's compelling. A fine rendering of history in picturebook format." --(starred) Booklist. Jeanette Winter has written and illustrated almost 50 books for children, including Diego, Emily Dickinson’s Letters to the World, The Librarian of Basra, Georgia, and Mama. Her art with flat colors and perspectives in the folk art tradition have brought her many honors. She lives in New York City.